One of my major challenges as an artist is the ability to create intentional art. What I mean by that is for example, the monotone painting I created this past weekend (below) was the result of the desire to do something different -a challenge of sorts. I painted this one and was very happy with it so I attempted to do another without success. And then I tried another and another and… another with no success. I often find this happens; when I try something new, I am happy with the first piece and it goes downhill from there. Therefore my pieces tend to be one-offs – individual works not related to another other than being a landscape or a portrait or… etc. (There is a current exception right now with the nest series.) I would like to change this. I would like to know what I want to achieve and be able to achieve it. Well, I say that… and yet I also love these surprise successes because they push me in new directions (the monoprint challenge is a good example). I am capable of improving, I just jump around a lot. And I feel like I have an excess of work which ends up on the trash can though Andrew tells me I’m likely not alone. If I were capable of creating a success every time – would I get bored with making art? Or is that mindset stopping me from achieving that goal? What I know right now is that I really, really want to make more successful monotone portraits. It is springtime in Victoria, which means all the summer/fall exhibitions are sending out their calls to artists for submissions. Andrew and I are taking a year off from participating in the AGGV Moss St. Paint-in. I’m not entirely comfortable with that much social interaction (read: introvert) and the date of it lands just before we go on vacation so we will have our hands full. However, we will be submitting to the Sooke Fine Arts Show again this year and we’re considering submissions to the Sidney Fine Art Show and the Salt Spring National Art Prize show. Additionally, this year I am sending this piece to the AGGV Art Rentals and Sales. It is interesting to think of a piece being rented out and going to new locations. I’d like to strap a camera to it to see where it ends up! The rental program only accepts larger pieces (minimum 30″), so I’ll have to work on a few more biggies. I’ve also submitted 3 pieces to the AGGV Summer Small Works Show and Sale which I would love to participate in. All of these submissions and events add up to time spent getting the work out there versus creating it. Our summer vacation will be spent almost entirely en plein air, so I hope to make some progress on the quality of my on location painting skills. Summertime, when the livin’ is easy. Still life setup with nest, bowl and egg. 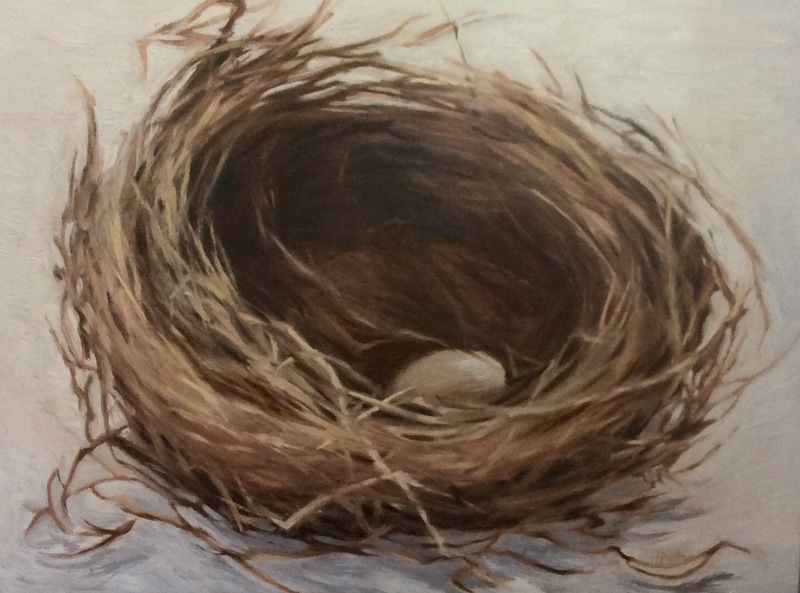 A curious thought occurs to me – is the nest a reflection of what I am doing and/or want to do in life? Am I actually nesting? My favourite place in the world is home right now. It hasn’t always been – when I lived in View Royal and was single, my favourite place was the Esquimalt Lagoon. I painted and played there – a few romances included and I spent untold hours walking in meditation with Thich Nhat Hahn along the slippery path beside the lagoon and up into the neighbourhood. I learned how to create a safe, warm and comforting place within my own self on that beach. With years and marriage and a new home between then and now, I see and feel that I’ve externalized a lot of my comfort. In Colorado, I made each of my apartments and house my nest along with a routine of life drawing in a small art school which gave me repetitious, constant comfort. In Utah I lived in a hotel for 2 weeks and then in an empty apartment for a month before my belongings made their way down. I remember immediately feeling more myself when my things arrived – it wasn’t even a lot of stuff – but there were within it little reminders of who I am and where I’ve been. Aren’t we all made up of a collection of disparate memories, knowledge and hopes? My nest had arrived. I am a person of routine and I am always comfort-seeking. I take a lot of my comfort from my husband and home now but I still have to gather within myself the pieces and parts which make me, me. Perhaps the nest is my perfect metaphor. Or maybe I just like the feel and balance of messy line work which leads up to a finished, tighter image or self; externalized. However, our town home is not somewhere that Andrew or I ever imagined ourselves living, let alone nesting. It is so much more upscale than we were used to but it makes so much financial investment and artistic space sense that it just works. And yet it is tenuous because it does push our financial boundaries. If one shoe falls, we may have to abandon the space for a much smaller nest. (Cross your fingers it doesn’t). You can, however, say that about any home we would own OR rent. We all (mostly) have to pay those bills and learn to live with the fact that the nest could fall apart at any time – and that knowledge is a process of letting go even if it doesn’t happen. The looseness of the lines perhaps reflects the tenuous nature of anyone’s employment, relationships, life situations. We all live on the edge of it all unraveling into a mass of twigs and we all have the capability of walking away with comfort within ourselves.